There is a lot of competition for cabin crew jobs these days. 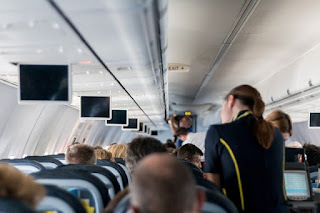 Because of its desirability, getting a job as a cabin crew has been notoriously difficult, and this economy doesn’t help, but following these tips will help you get an airline to decide you will fit into their flight plan. Most airlines and the FCC have specific minimum and maximum physical, educational, and experience regulations. Research these online and make sure you meet these requirements before you send your resume. There are many community colleges, trade schools, and online courses that offer flight attendant training. Training can give you a good advantage, as long as you choose the right school or course. Choose one that is accredited and has a proven success rate of graduates who have been hired by airlines. Keep in mind, that a certificate isn't required and you're better off with a job experience as described next. Flight attendants are the representatives of the airline who most often deal directly with customers. For this reason, airlines want their cabin crew to be able to deal with the public calmly and politely. If you have worked as a waiter, retail clerk, teacher or teaching assistant, or any other professional who deals with the public on a daily basis, you will gain an advantage. So you’ve landed an interview! Congratulations! There are a few things you can do before the interview to help you impress the recruiter. Research the history and policies of the airline with which you will be interviewing. Most of this information is available online. Spruce up your appearance, make sure you have appropriate clothing for the interview. Nothing says “professional” like a suit in a conservative color such as navy or charcoal. Get a haircut! Women’s hair should be collar length or shorter or neatly tied back in a bun. Men’s hair should be shorter than collar length and neatly combed. For both men and women, hair should be a conservative, natural-looking color with no roots showing. Make sure your teeth are clean and whitened. If your teeth are overly crooked, see a dentist or orthodontist about getting them straightened. One set of ear piercings is acceptable for women. Remove any jewelry from other visible piercings and allow the holes to close. Practice speaking in a clear, pleasant-sounding voice. If you speak with a slight accent, that’s usually fine, but study your grammar so you speak proper English. If you have a nasal-sounding or high-pitched voice, consider working with a speech therapist to help you get a better tone. Q&A: is physical perfection required? You don’t need perfect teeth or perfect skin and not even perfect hair. Because perfection doesn’t really exist. Your teeth must be clean and cavity-free. Your skin must be healthy. And for those bald spots, you can always get a hair transplant or grow your hair naturally to be neatly arranged. You must have a proportionate weight and height. You must be tall enough to reach the emergency equipment located in the top storages in the plane. Your skin must be free of ink. That’s not a standard of beauty, that is the respect the airline wants to show towards customers. So no, physical perfection is not required. However, you need to show that you are considerate, resourceful, willing to help and respectful towards others. Instead of worrying about unattainable standards of beauty, work on improving your performance in group exercises, English Test or Final Interview Questions and Answers. Be on time. Arriving too late (or, in some cases, too early) will make an immediate bad impression and hurt your chances with the interviewer. If you have an emergency that absolutely cannot be avoided, call the interviewer as soon as you know you will be late to reschedule. What experience do you have dealing with the public? Do you have any training that would help with the duties of a flight attendant? Try to relax. While it’s normal to be a little nervous, you don’t want to appear too anxious. Remember, a flight attendant needs to remain calm under pressure. Practice calming breathing exercises to get your nerves under control. At the end of the interview, the recruiter will undoubtedly ask if you have any questions, so prepare one or two knowledgeable questions ahead of time. Questions to avoid are those regarding salary, which will be discussed once the airline decides to make an offer or anything that was already answered during the interview - you don’t want to appear as if you weren’t paying attention. Additionally, the recruiter will probably ask you to read an airline boarding card aloud. Find a copy online and practice reading it. While there’s no guarantee that following these suggestions will get you hired, they will certainly help you gain an advantage. Finally, you can give yourself an immediate advantage that will put you ahead of your competition by leaps and bounds, by taking the time to invest in flight attendant training for yourself. If you don’t get hired by the first airline that interviews you, don’t give up! There are many others, from small commuter lines to large international corporations, who hire people every day. If you follow these guidelines and persevere, sooner or later the right airline will take you on board.